There’s going to be a lot of hustle and bustle going on in NYC on Thursday, September 6th. That’s ‘Fashion’s Night Out’ and fashionistas get to mingle from store to store and various events throughout the city to preview all the new collections. 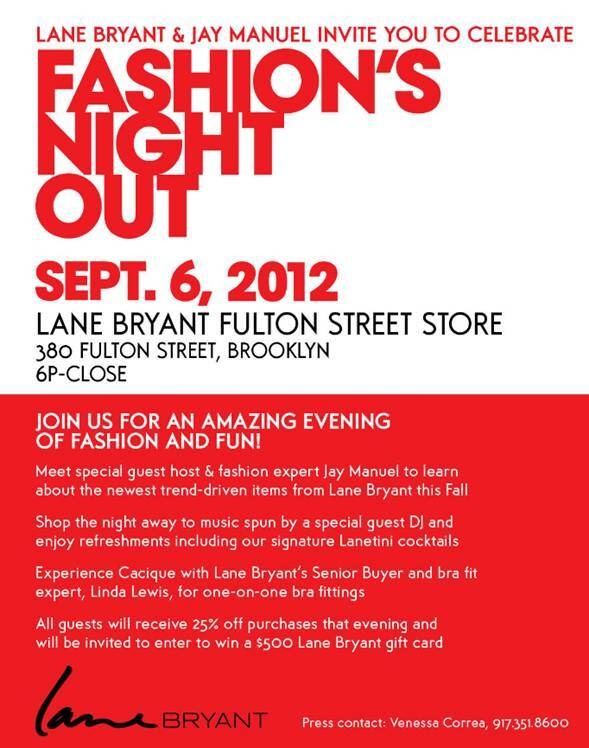 Great news for plus-size ladies, Lane Bryant and Jay Manuel have teamed up to participate in the festivities. They will be at the Brooklyn Lane Bryant location from 6pm-close. So ladies set your agendas now and map out your destinations because you will want to attend as many events as possible. (Most other events are from 6pm-11pm so you have a wide time span to get to and fro).